This book contains c. 670 illustrations in full colour, most of which are published here for the first time. They mainly come from 36 churches from Amari province, examined in this publication. After a short description of the architecture, the author investigates the iconographic programme, iconography, style and date of every church. A ground plan with the layout of the paintings recorded on it and a list of subjects decorating almost every church are included. A chapter of conclusions summarises the iconographic programme and the iconography of the various scenes and saints of the entire province. Special attention is always paid to the particularities appearing in every part of this study. The wall paintings of the Amari province greatly contribute to our knowledge of Byzantine art, not only with rare and singular subjects but also with the artistic quality of the paintings, which occasionally can be compared to that seen in Constantinople and other great artistic centres of Byzantium. CONTENTS: Preface, Introduction, The churches 1-36: 1. Agia Paraskevi, Panagia. 2. Agios Ioannis, St. John the Baptist. 3. Amari (Nefs), St. Anna. 4. Amari (Nefs), St. John the Baptist. 5. Amari (Nefs), St. Theodore. 6. Apodoulou, St. George. 7. Apostoloi, St. Nicholas. 8. Apostoloi, St. Spyridon. 9. Chordaki, Panagia Faneromeni. 10. Elenes. St. Nicholas. 11. Fourfouras, Panagia. 12. Fourfouras, St. George. 13. 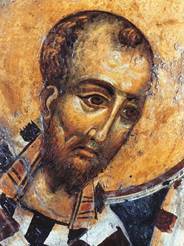 Genna, St. Onuphrius. 14. Gerakari (Foti), St. John the Evangelist. 15. Gourgouthoi, Panagia and St. John the Baptist. 16. Gourgouthoi (Mertakones), St. George. 17. Kalogerou, St. John the Evangelist. 18. Kalogerou, St. Marina. 19. Kalogerou, St. Paraskevi. 20. Kardaki Archangel Michael. 21. Klisidi, St. George. 22. Lampiotes, Panagia. 23. Lampiotes, St. Nicholas. 24. Meronas, Panagia. 25. Meronas, St. Nicholas. 26. Meronas, Varia (Panagia, Sochora; Saviour, Meronas; St. George, Rologi; St. John the Baptist, Meronas; St. Paraskevi, Meronas). 27. Monastiraki, Archangel. 28. Monastiraki, St. George. 29. Patso Panagia, 30. Petrochori, Sts. Apostles. 31. Platania, Panagia. 32. Thronos Panagia. 33. Vathiako, St. George. 35. Vistagi, St. Nicholas. 36. Voliones, Soter. Conclusions, Bibliography, Index. List of Illustrations. Illustrations 1-671. Bound 24x17 cm., 664 pp. (325 pp. text plus c. 670 illustrations in full colour, a few in black and white). 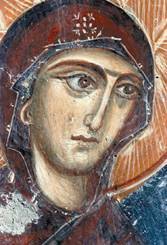 The Virgin, St. John, Kalogerou, 1346/1347 A.D. 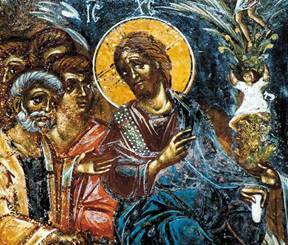 The Entry into Jerusalem, Meronas, beginning 15th c.
St. John Chrysostom, Thronos, c. 1300 A.D.